MK Dons have signed former Dundee defender Gary MacKenzie on a two-year deal and released four players. 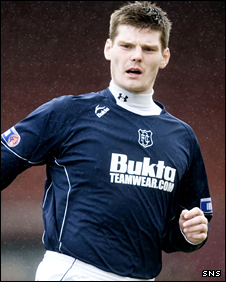 MacKenzie, 24, started out at Rangers before joining Dundee, where he made 97 Scottish First Division appearances before being released last week. He is boss Karl Robinson's second signing, following David Martin to MK. Defenders Sol Davis and Darren Powell and midfielders David King and Lewis Gobern will leave the club when their contracts expire on 30 June. King, 19, was an academy product at Stadium MK while 30-year-old Davis was signed on a free transfer in August. Gobern, 25, and Powell, 34, both made over 20 appearances during Paul Ince's final season as manager.